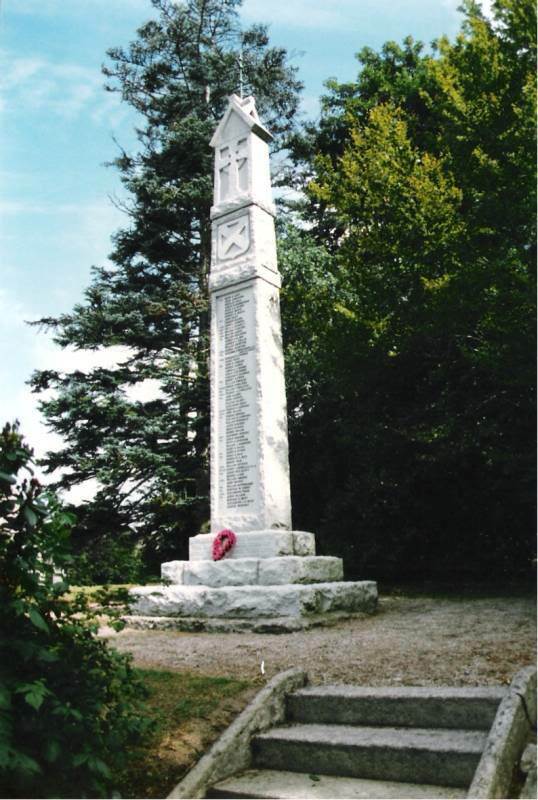 Kemnay has four memorials to commemorate the Great War, the first is a granite monolith erected in 1922, which bears a roll of honour to 65 people that lost their lives in WWI and a further 10 that lost their lives during WWII. This monument stands at what was once the entrance to Kemnay Railway Station, on the corner of Station Road and Grove Road. 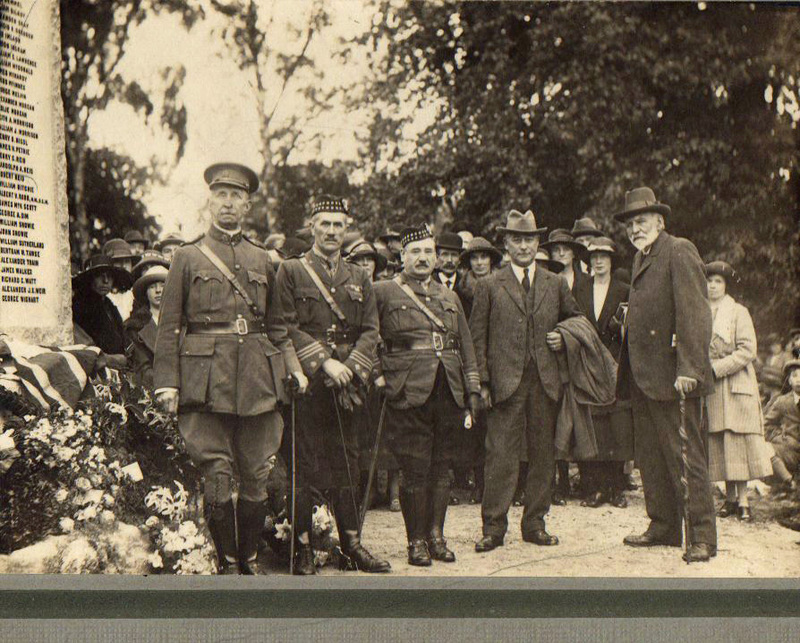 My guess would be that the above photo was taken in September 1922 at the dedication of the memorial. If I’m correct, then the man in uniform on the left would be Col. The Reverend James Smith, and the officer next to him is possibly Lt. Col Robert Bruce D.S.O., M.D. – I can’t see the whole of the rank badge on the third officer, but he is another Lt. Colonel so there are two to choose from. Duncan Downie may be able to identify the other two in the front row. As this memorial was organised by the local doctor, perhaps he would be in the photo? 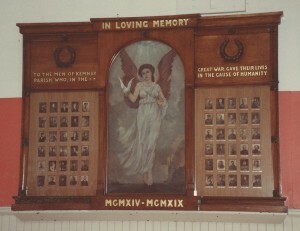 The second memorial is located within Kemnay Primary School hall and consists of a magnificent oak panel in three sections. The central panel features a painting of an Angel walking through war ravaged countryside and about to release a dove of peace from the palm of her right hand. 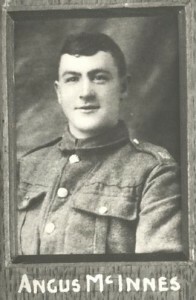 The panels to either side contain photographs of all but one (James A L Durno), of 61 people that gave their lives in the Great War. 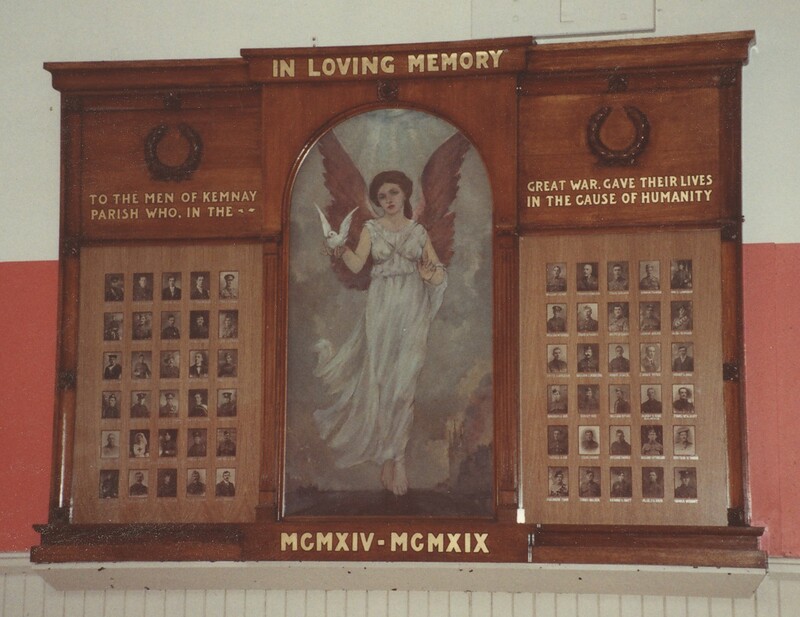 This panel suffered considerable water damage during the late 1980s at which time the panels containing the photographs had to be renewed in oak plywood. Regrettably, the remedial work was not of the highest standard and in particular, the lettering bears little resemblance to the quality of the original work. The school memorial was rededicated on Saturday 10th November 1990. 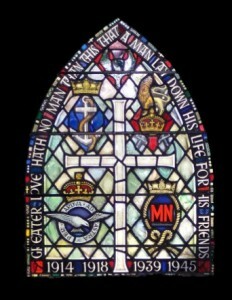 The third memorial is in the form of a stained glass window located in Kemnay Parish Church of Scotland. 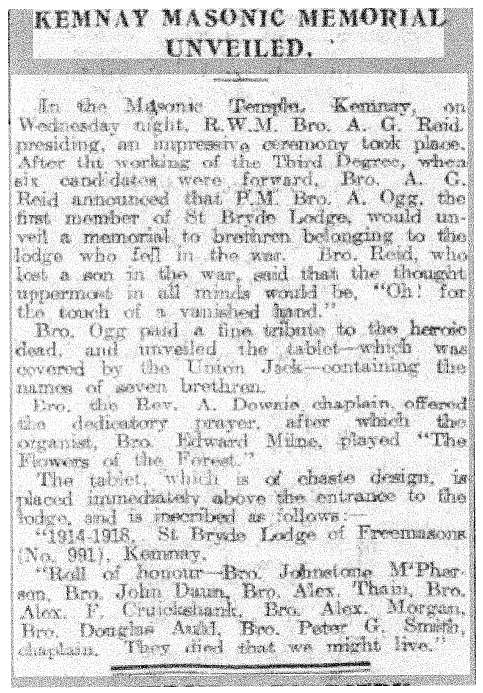 The fourth War Memorial is located in the St. Bryde Lodge Of Freemasons (No. 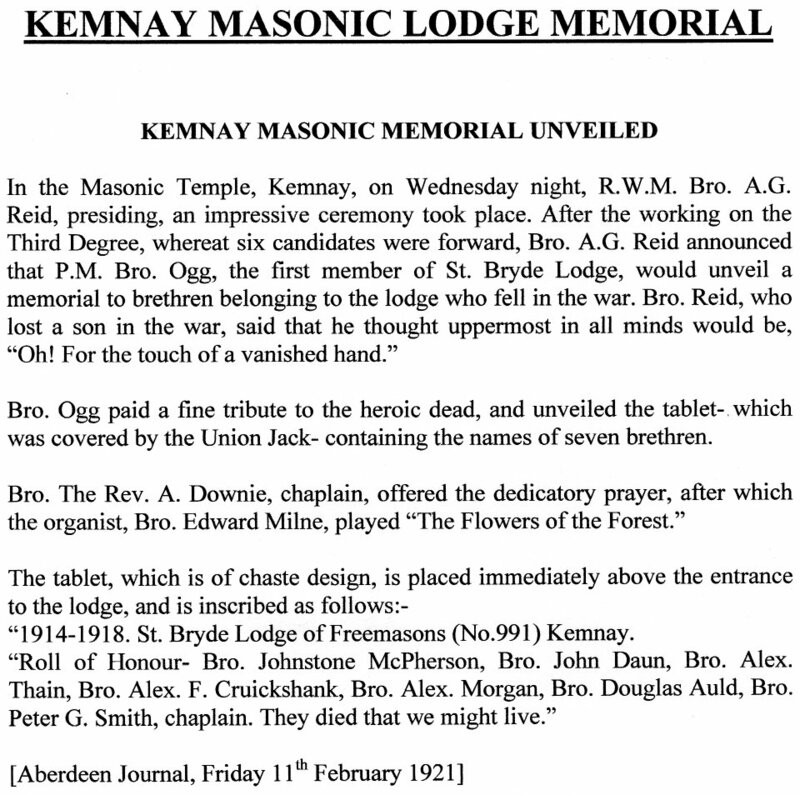 991), in St. Brydes Road, Kemnay and comemorates seven Freemason Brothers. More information regarding the reasons for having both a granite and an oak panelled monument, and why the latter bears four names less than for former, can best be explained by visiting the Kemnay Newsletter February 2014 page and reading the article written by Duncan Downie, which also appears on his Kirkstyle website. More information regarding the stained glass window memorial can be found by reading the Kemnay Parish Church booklet “They Grow Not Old” (pdf file) which is listed at the foot of this page. 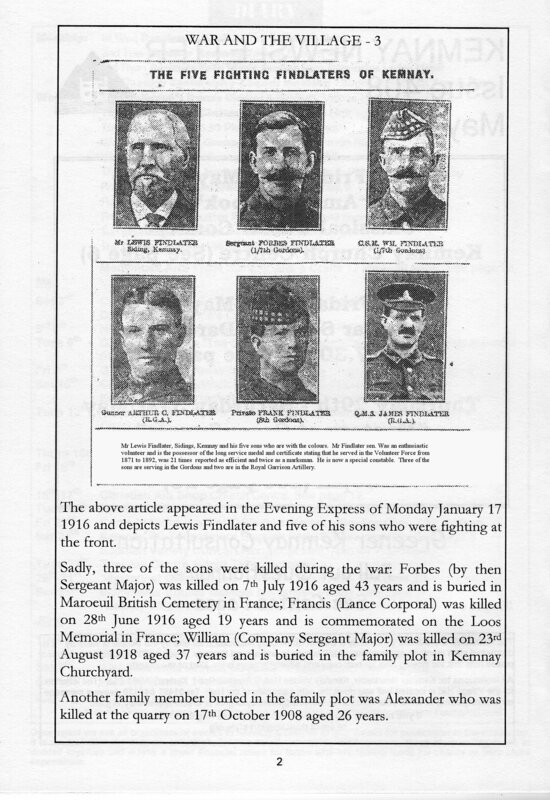 Acknowledgements and many thanks go to Anne Park for all the details relating to all those listed on the WWI roll of honour and Duncan Downie for providing so much information including copies of all the photographs along with his article “They Grow Not Old”, upon which the Kemnay Parish Church booklet is based. Also acknowledged is Rev. Gaenor Berkin for all her past research and indeed her continuing research. 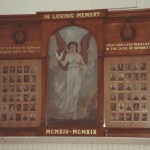 Many thanks also to Bill Conn for supplying a photograph of the memorial in St. Brydes Lodge of Freemasons No. 991. 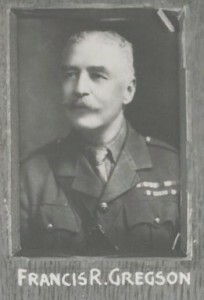 The following names appear as they are listed on the granite monument and with the exception of the aforementioned James A L Durno, the names without photos are not listed on the oak panelled monument. The S before the Army number is for a short enlistment for the duration of the war as opposed to normal enlistment which was for a fixed number of years. 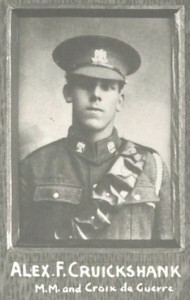 Abel David Stuart Pte 3808 2nd South African Regt Age 20 Died F & F 12-Oct-16 Son of William Abel, South Ley Lodge, Kintore. Thiepval Memorial M. R. 21 Pier 4 Face C Photo taken 2004 Nov. 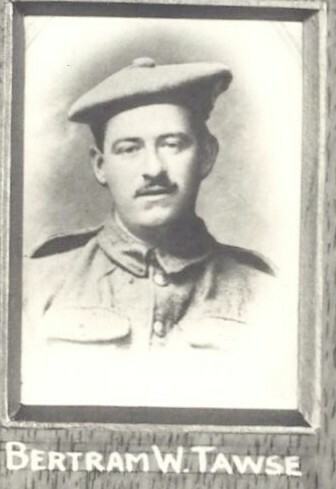 He is also mentioned on his grandparents gravestone in Kemnay. One reason for his being in the South African Infantry was that his father was working in South Africa. 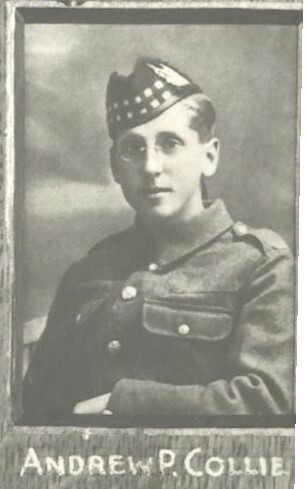 (Glasgow Herald 7th June 1915) “Private John Anderson, 4th Battalion Gordon Highlanders, has been killed in action, having been shot in the head while in the trenches. 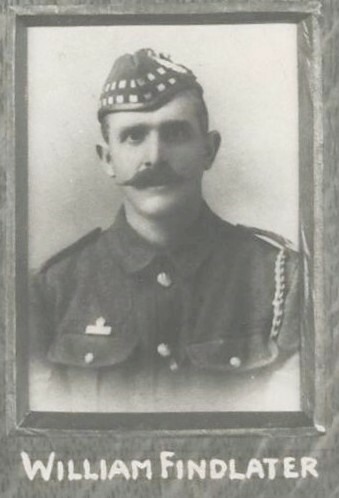 He was the fifth son of Mr James Anderson, Don Cottage, Port-Elphinstone, Inverurie, and before enlisting was a butcher with the Don Co-operative Society at Kemnay.” CWGC ANDERSON, JOHN Rank: Private Service No: 3154 Date of Death: 28/05/1915 Regiment/Service: Gordon Highlanders 4th Bn. Panel Reference: Panel 38. Memorial: YPRES (MENIN GATE) MEMORIAL. 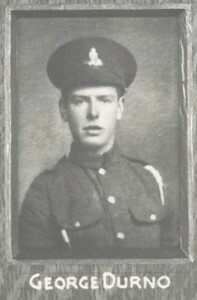 Following Research by Gaenor Berkin, the grave of Private Anderson has been identified at Birr Cross Roads Cemetery, Plot 3, row C, grave 6. A rededication took place in Belgium on 17th October 2017. His name will be removed from the Menin Gate memorial. 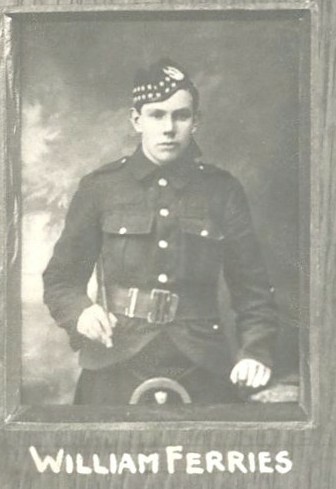 Auld Douglas Pte 242238 2nd bn. Gordon Highlanders b Kemnay e Aberdeen Killed in Action F & F 26-Oct-17 Tyne Cot Memorial M. R. 30 Panel 135 to 136. Born Kemnay, enlisted Aberdeen, son of William and Catherine Auld. 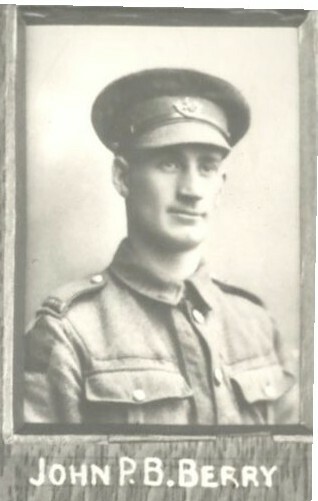 “Another of our gallant lads Pte. Douglas Auld, Gordons, has made the supreme sacrifice. It is only a few short weeks since he was here on draft leave and it is difficult to realise that we will not see his cheery face again. Sincere sympathy is extended to Mr and Mrs Auld, Dunrobin, Kemnay and other relatives in their loss” [Aberdeen Weekly Journal, 16 November 1917]. Also commemorated on the memorial in St. Brydes Lodge of Freemasons No. 991. Private George Simpson Clark, 351640, 9th Bn Royal Scots, died 3rd August 1917. He is commemorated on the Ypres (Menin Gate) Memorial Belgium, MR 29. There are no next of kin details. 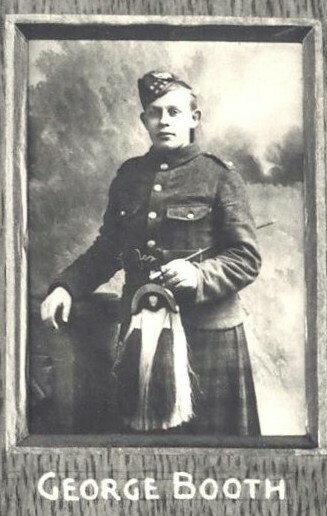 Alexander Fraser Cruickshank Pte 40943 MM CdG (France) 7/8th King’s Own Scottish Borderers born Kemnay 07/11/1893 enlisted Aberdeen residence Sauchen Age 24 Killed in Action F & F 06-Mar-18 Son of Henry Cruickhank & Jemima (nee Martin) Cruickshank. 1901 Census: Paradise Cottage, Kemnay. attd. 46th Trench Mortar Bty. Soldiers Died Alex Cruikshanks: Formerly 22209 RCR. Feuchy Chapel British Cemetery, Wancourt Fr 0531 Plot V Row H Grave 3. 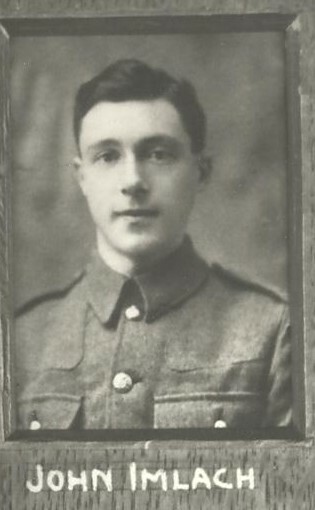 Information has been received by Mr H Cruickshank, settmaker, West Mains, Kemnay, that his youngest brother Private A F Cruickshank, Trench Mortar battery, has been killed in action. Before enlisting, he was a blacksmith at Cluny [Aberdeen Daily Journal 13 March 1918]. 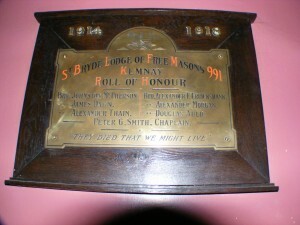 Also commemorated on the memorial in St. Brydes Lodge of Freemasons No. 991. 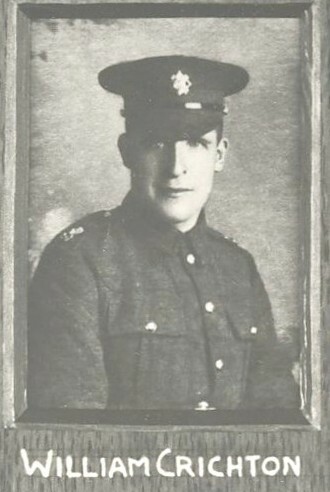 Daun James Pioneer 403983 319th Royal Engineers Road Construction Coy b Newhills e Aberdeen r Kemnay 30 Killed in Action France & Flanders 25-Sep-17. Born at Newhills, enlisted in Aberdeen, resident at Kemnay. Son of Alexander Daun and Elizabeth Slorach Daun, Dalmadilly, Kemnay. La Clytte Military Cemetery, Reninghelst B 021 Plot III Row B Grave 19. 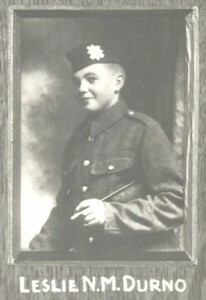 Prior to enlistment, James Daun raised money for The Aberdeenshire Red Cross Fund. Source: Aberdeen Daily Journal 23 February 1915. He was killed by a shell. 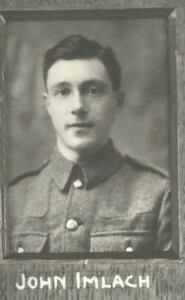 Previously served in Royal Garrison Artillery. 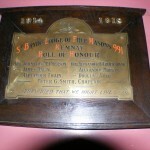 Also commemorated on the memorial in St. Brydes Lodge of Freemasons No. 991. 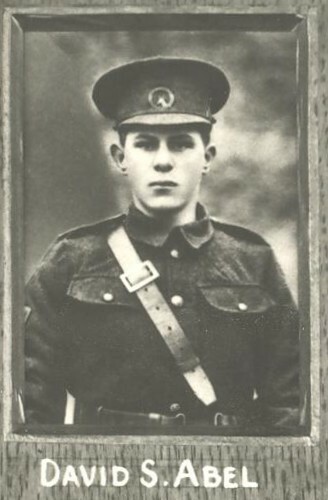 Private John Watt Duncan, 138487, 3rd Bn Machine Gun Corps, died 25th August 1918, aged 20 years. 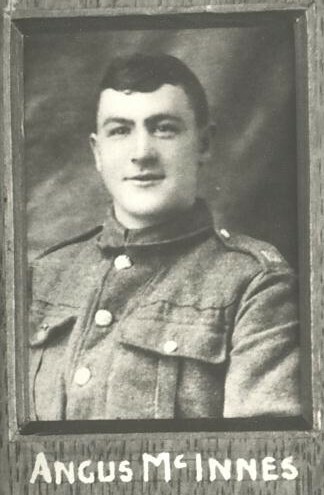 He is buried in Bagneux British Cemetery, Gezaincurt, France, Plot 4, Row G, Grave 23 (FR 84). Son of Robert and Annie Duncan, Kemnay, Aberdeenshire. Margaret Isabella Kathleen Durno Voluntary Aid Detachment born Kemnay Age 21 Died London 14/09/18 Daughter of Barbara Jane (nee Mortimer) Durno, Grant Lodge, Kemnay & the late Alexander Durno. 1901 Census: Leschangie. B 1897. Father’s Occ: Farmer. Monymusk Memorial : Grant Lodge. Died Woolwich, London. Brothers James & Leslie also died. Blairdaff & Monymusk. 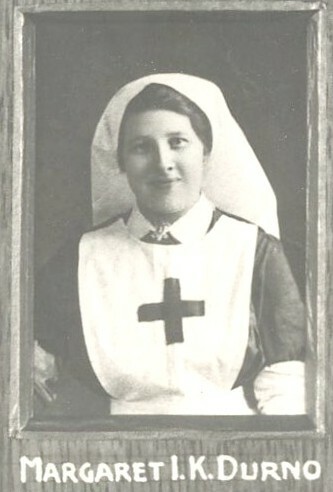 Margaret Durno was not on active service but was with Voluntary Aid Detachment working as a laundress at Brook War Hospital, Shooters Hill Road, London where she died having succumbed to the influenza prevalent at that time. She is buried in a communal grave in Greenwich Cemetery. Her condition was classified as non-war related resulting in her not being considered by the Imperial War Graves Commission’s criteria for inclusion in the Debt of Honour Register. 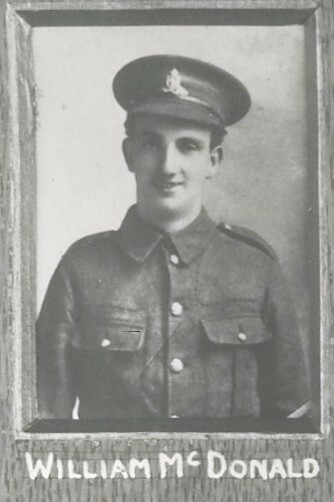 Gunner William McDonald, 31105, 368th Bty, Royal Field Artillery, died 16th April 1915, Commemorated, The Helles Memorial, Gallipoli, Panels 21 and 22 (MR 4). No next of kin details. Morgan Alexander Gnr 5658 3rd Australian Field Artillery e Brisbane 26 Died of Wounds F & F 17-Dec-16 Son of Archibald & Margaret Morgan, Hillford, Kemnay. Occ: Joiner. Ed Kemnay Higher Grade. St Sever Cemetery Extension, Rouen Fr 0146 Block O Plot III Row L Grave 6. Alexander Morgan was wounded in action on 18 November 1916 sustaining shell splinter wounds to his left hip and heel. He died of those wounds at 12.12 pm on 17 December 1916. Also commemorated on the memorial in St. Brydes Lodge of Freemasons No. 991. Private William John Morrison, 202082, 4th Bn Gordon Highlanders, died 21st November 1917 aged 38 years, Commemorated, The Cambrai Memorial, France, Panel 10 (MR 17). 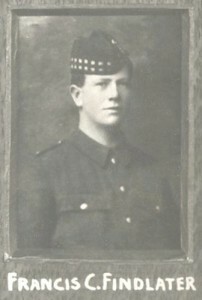 Son of Mrs Penelope Morrison, Aberdeen. Robb Albert V. Second Lieutenant M.M. D.C.M. Thain Alexander L/cpl 315718 13th Black Watch (Scottish Horse) b Kemnay e Dunkeld Age 29 Killed in Action F & F 03-Oct-18 Husband of Marjory Thain, Roslyn Cottage, Kemnay. Formerly 6022 Scot Horse. Unicorn Cemetery, Vend’huile Fr 0212 Plot IV Row E Grave 19. 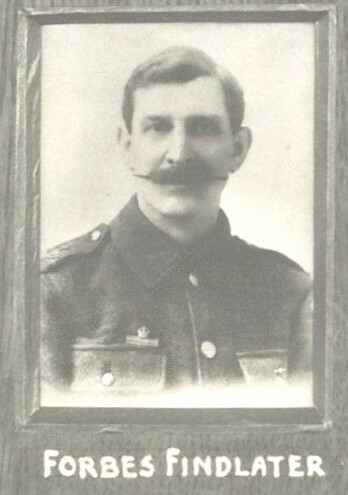 Mrs Thain, Roslyn Cottage, has received word that her husband Private Alexander Thain, Scottish Horse, has died of wounds. 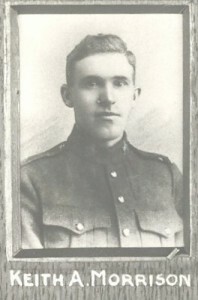 Private Thain was previous to enlistment a Blacksmith at the Quarries. 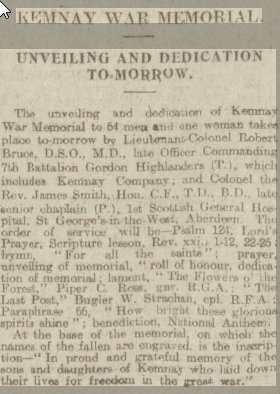 [Aberdeen Daily Journal14 October 1918]. Also commemorated on the memorial in St. Brydes Lodge of Freemasons No. 991. 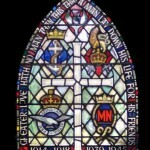 The stained glass was fitted in the window at the same time as the memorial window on the opposite side of the church was installed in 1972. Service no. 3808; 2nd Regiment, South African Infantry, died 12th October 1916 aged 20 years. 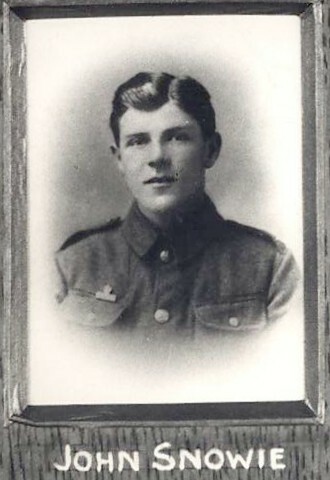 He is commemorated on The Thiepval Memorial, France, Pier 4 Face C [no known grave]. He is also mentioned on his grandparents gravestone in Kemnay. 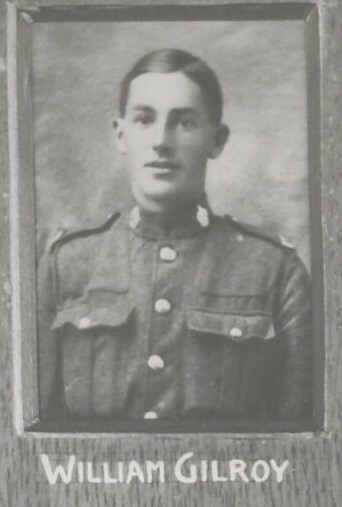 One reason for his being in the South African Infantry was that his father was working in South Africa. John Cheyne was born at Muiryfold, Turriff on 1st May 1916. (The night the German airship crossed over the district). He was the second son of George Cheyne who was a horseman at that farm. Up to May 1929, John received his education at Woodhead, Fyvie, at which time his father moved to Todfold, Kemnay, where he worked with Allan Forbes, Tillybin, Kintore. 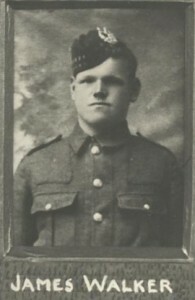 John finished his education at Kemnay Secondary School and then worked for two years on local farms. 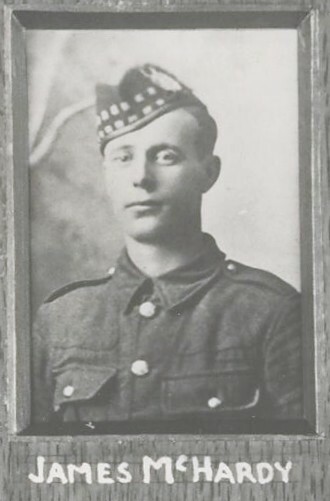 At a little over sixteen years old, he lied about his age and joined the 2nd Battallion Gordon Highlanders doing spells of service in Gibraltar and Singapore. 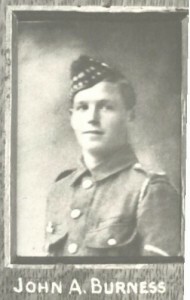 Following his seven years in the Gordons, he worked with J. Joss in the sand quarries at Bridge of Don. 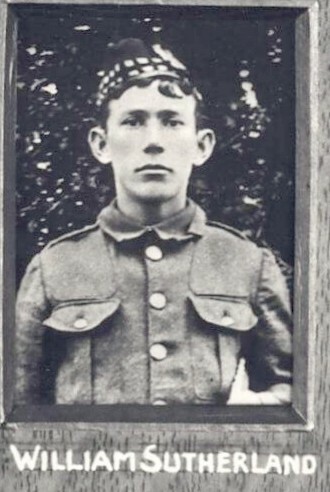 At the first sign of hostilities, he was recalled from the reserves to train conscripts, a job which he disliked, as he could not thole to train boys to go out to be killed, while he, a trained soldier, remained at home. When the 11th Scotch Commandos was formed, he was one of the first volunteers and took part in many of the first raids. The 11th Commando was disbanded in the summer of 1941 and John Cheyne was one of the first to be picked by David Stirling to form the S.A.S., the elite band who were trained to work in small numbers behind enemy lines. He perished on their first raid on the night of 17/18 November 1941. They set off from an airfield in Cyrenaica in Libya, fifty five men in five old Bombay aircraft, with the intention of parachuting behind enemy lines to place a limpet mine on every plane at Malene and Tmimi aerodromes at Gazala. They ran into a terrific thunderstorm and no one knows yet what happened to most of them. He has no known grave and his name appears on the pillar of the Alamein Memorial. 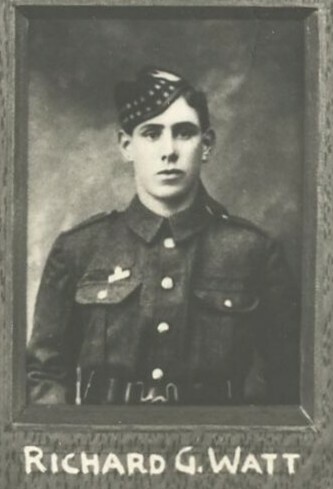 Lyall Harvey was born at Osborne, Dalmadilly, Kemnay, on February 28 1915, the son of Mr and Mrs Archibald Harvey. The family later moved to Orient, Kendal Road. He attended Kemnay School, following which he served his apprenticeship as a baker with Thomas Milne in Station Road, Kemnay. 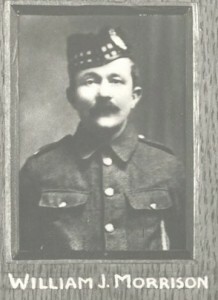 He then worked as a confectioner with Kennoways Bakery in Aberdeen. 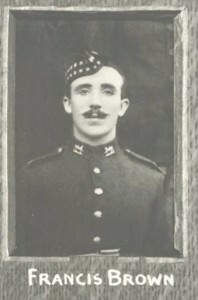 He was a sportsman of some repute, being a champion golfer at Kemnay on several occasions, and also had a keen interest in badminton. 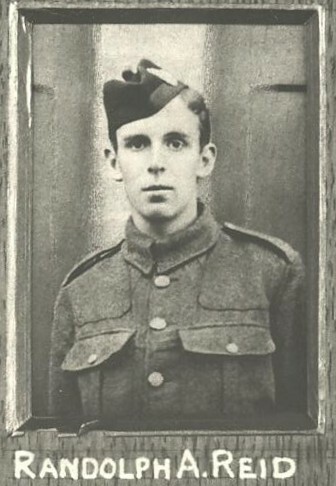 On the outbreak of hostilities he went to Stevenson in Ayrshire to the army supply bakery, which was a reserved occupation. He joined the R.A.F. in 1941 and gained his wings at Evanton in Rosshire and served later at St. Johns Wood, London. He was posted missing presumed killed, on 23rd January 1944, after a bombing mission over Norway. 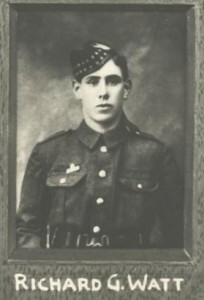 Bertie Knowles was born in Aberdeen in 1912, the son of Mr and Mrs William Knowles. His parents moved to Lilydale, Aquithie Road, Kemnay, in 1924 from where his father carried on a fish retail business. 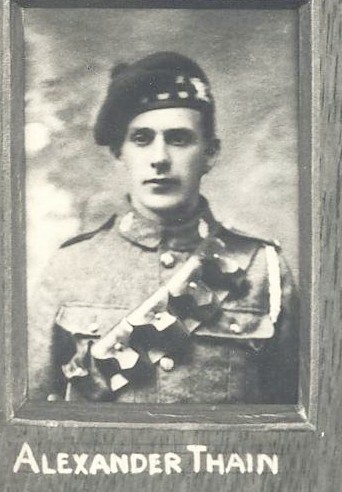 Bert trained as a mental nurse at Cornhill Hospital in Aberdeen and enlisted in the Gordon Highlanders in 1940. He was killed at Tripoli in 1943. 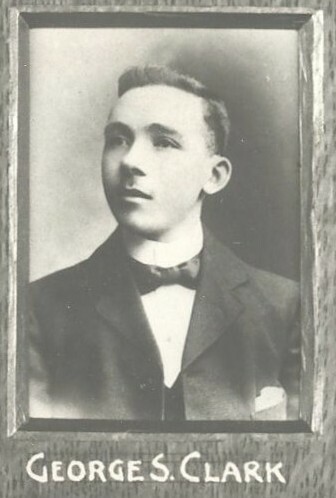 George W Lawrie was the youngest son of James and Margaret Lawrie, Brownhill, Kemnay. He was educated at Kemnay School and left at sixteen years of age to take up employment on a farm. One of the school teachers of the time, Miss Elsie Harper, persuaded him to return to school to carry on with his studies. This he did and in 1934 was dux of the school. He then went on to Aberdeen University where he graduated M.A. 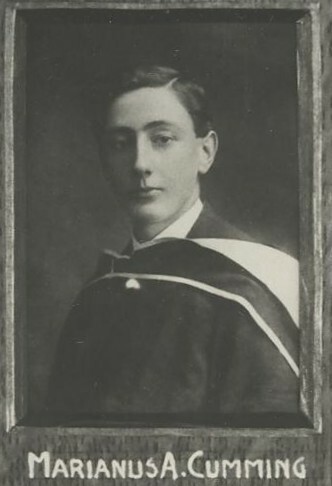 with 1st Class Honours, before going out to Malaya to work in a rubber plantation. When war broke out the Japanese moved into Malaya. George was called up, joining the Johore Volunteer Engineers. Tragically, while being treated for injuries sustained in battle, he and everyone in the hospital were massacred on 23rd February 1942. He is commemorated on column 9 of Singapore Civil Hospital Grave Memorial, Singapore. 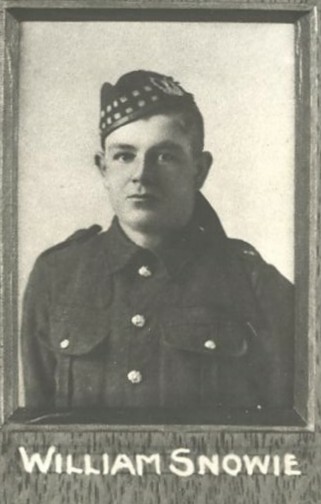 The following poem entitled “Thoughts of a Dead Brother” was written on 18th January 1946 by his eldest brother, James, who retired to Balloch, Victoria Terrace, Kemnay, in 1944 after a lengthy career in the Ayrshire Police, in which he attained the rank of sergeant. That we might all go free. Of a soldier’s sun-kissed grave. And swallows cross the main. Oh glorious be his dream. Or flower upon his grave. Our hearts are full and sore. And bid us grieve no more. We will gather at reveille. 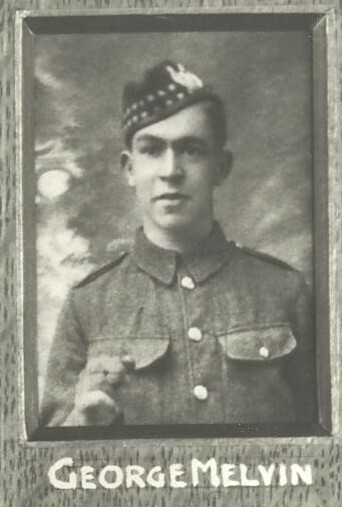 Lamond Nicol Milne was born at Fetterangus on 30th September 1914, where his father, Mr Thomas Milne, carried on the local bakery. 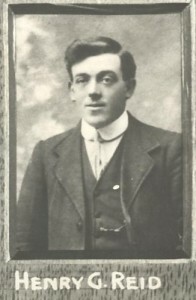 He took over the bakery in Monymusk in 1916 and moved to Kemnay in 1932, taking over the business in Station Road of McLeay. In his youth Lamond was a very active member of the boy scouts, then in their infancy in the village. 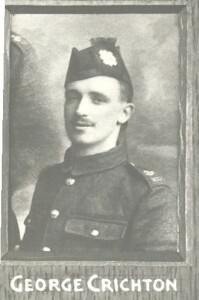 He was also a very keen golfer and after leaving the local school, he served his apprenticeshio as an architect with McMillan’s in Aberdeen. 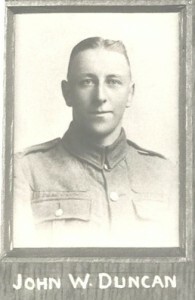 He was called up in 1940 and trained with the Royal Engineers at Pinefield, near Elgin and later moved to Northallerton. 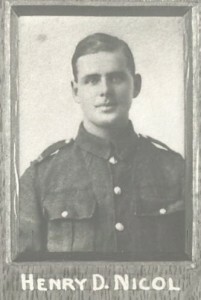 He was transferred to the Red Caps (Military Police) with whom he was serving in Burma when he was reported missing, presumed killed on 6th April 1943. 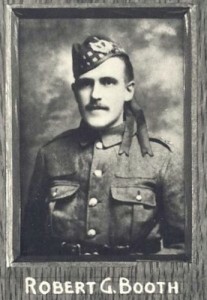 Charles McLeod was born at Kemnay on September 17 1914. His father, also Charles, served in the war 1914 – 1919, and was discharged in 1919 as wounded. 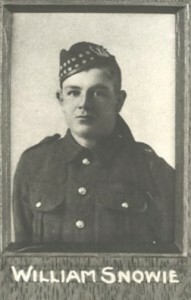 Charles jr., joined the Territorials in the early 1930s, but employment eventually took him to the north of Scotland, where he was unable to carry on with his training. On the outbreak of hostilities in 1939, he was not called up with the Territorials, but when his turn came by age. 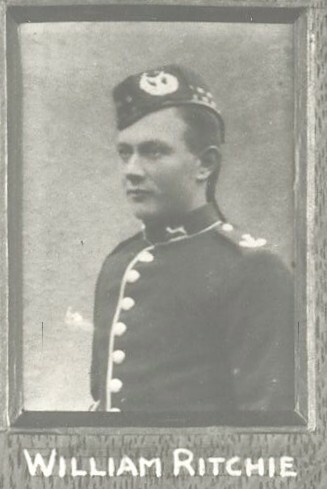 He first saw service with the Cameronians, but was later transferred to the Gordons and was stationed among other places in Orkney, where he was in the Guard of Honour inspected by the Duke of Gloucester. During leave in 1943, he married a girl in Montrose. 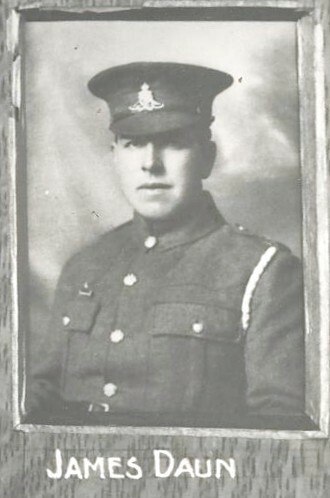 He was wounded in France during the offensive in the summer of 1944 and was flown home to Basingstoke, where he died on September 1 1944. 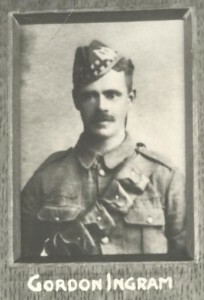 His body was taken home to Kemnay and buried in the churchyard. 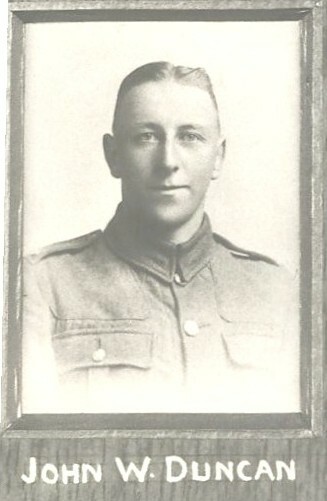 It saddened some of the local residents that Charles was never commemorated with a war graves memorial and it was not until the 1980s that steps were taken to rectify this. An approach was made to the Commonwealth Graves Commission from whom it was learned that Charles’ name appeared on a memorial in France – they had no knowledge of his having been repatriated to Britain. It also transpired that the local Council had no record of the interment. However, both organisations accepted the validity of the local undertaker’s records and details were changed accordingly. In due course a marble memorial was erected on Charles’ grave. 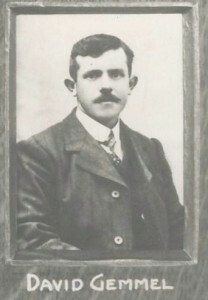 William Petrie’s father was employed on the farm of Milton, Kemnay. He was serving with the 2nd Battalion The Gordon Highlanders when he died on 23rd November 1944 aged 26. 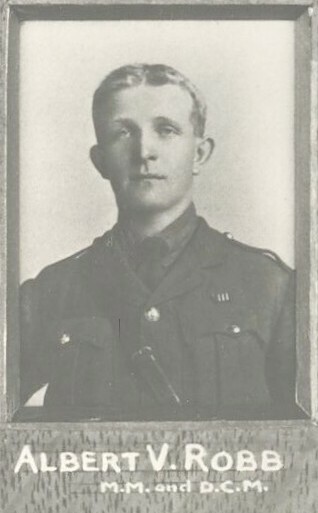 After the war his grave was among those the Graves Registration Service was unable to trace and he is commemorated on Column 80 of the Singapore Memorial, Singapore. 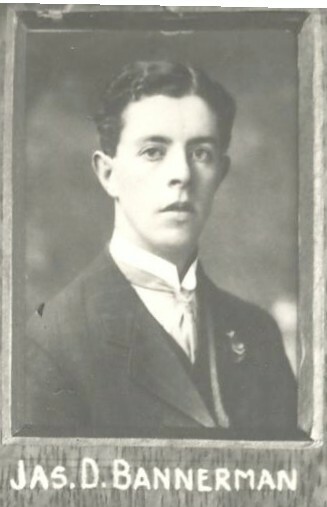 James Duguid Rae was born at Kinnernie, Cluny in 1915 where his father, James Rae, was a horseman. The family moved to Kemnay in 1916 where James Rae was employed as a horseman at Kemnay House. 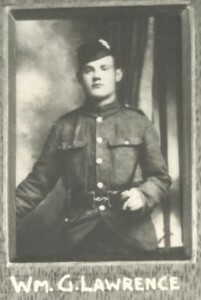 In 1918 the family moved to North Cottown, Kintore and James jr., walked from there to school at Kintore. On leaving school he served his apprenticeship as a butcher with William Gerrard, Station Road, Kemnay. He married Doris Daun in 1938 and they had one son John Daun Rae. He was called up in 1940 and received his training at Bridge of Don Barracks, moving from there to Colchester. 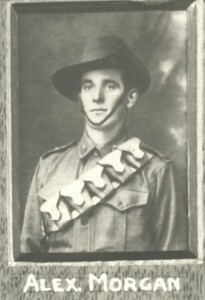 He was with the 51st Division throughout the campaign in Alamein and North Africa, moving up to Sicily. He came home from Sicily to take part in the “D” Day Landings at Normandy. 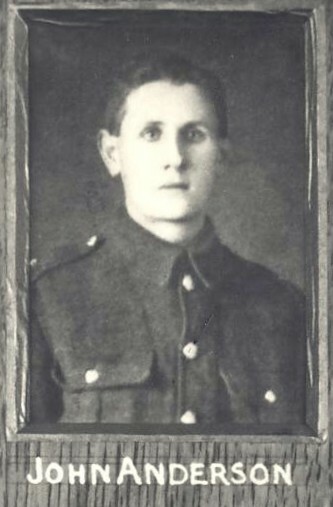 He was killed in France on 22nd June 1944 and is buried in Banneville-la-Campagne War Cemetery in France. 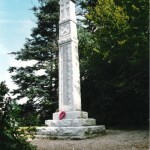 The fourth War Memorial is located in the St. Bryde Lodge Of Freemasons (No. 991), in St. Brydes Road, Kemnay. Details shown below are extracted from a newspaper cutting from Aberdeen Journal, dated Friday 11th February 1921. 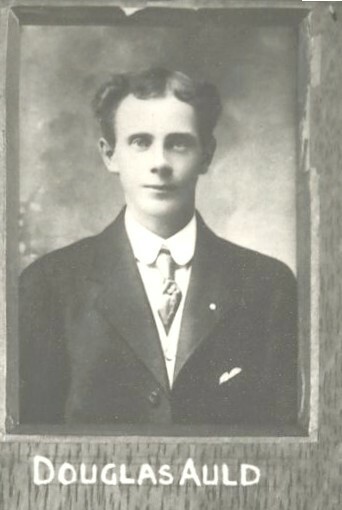 Cruickshank – Alexander Fraser M.M. 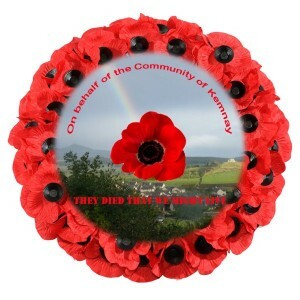 Details as listed above under the Kemnay Primary School memorial. 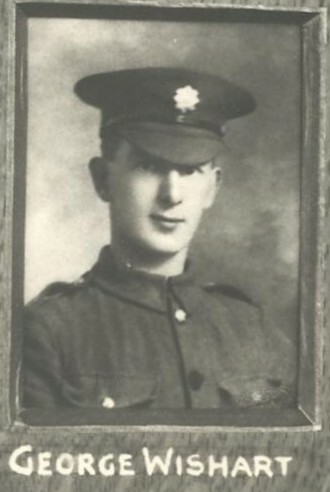 Daun James Pioneer 403983 319th Royal Engineers Road Construction Coy b Newhills e Aberdeen r Kemnay 30 Killed in Action France & Flanders 25-Sep-17. 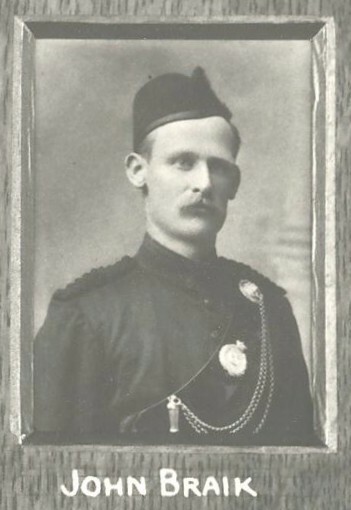 Born at Newhills, enlisted in Aberdeen, resident at Kemnay. 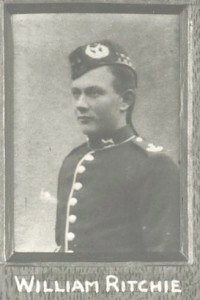 Son of Alexander Daun and Elizabeth Slorach Daun, Dalmadilly, Kemnay. La Clytte Military Cemetery, Reninghelst B 021 Plot III Row B Grave 19. Prior to enlistment, James Daun raised money for The Aberdeenshire Red Cross Fund. Source: Aberdeen Daily Journal 23 February 1915. He was killed by a shell. 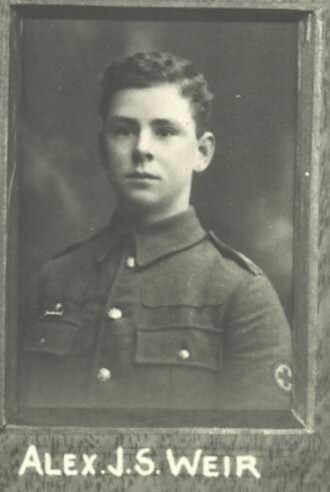 Previously served in Royal Garrison Artillery. 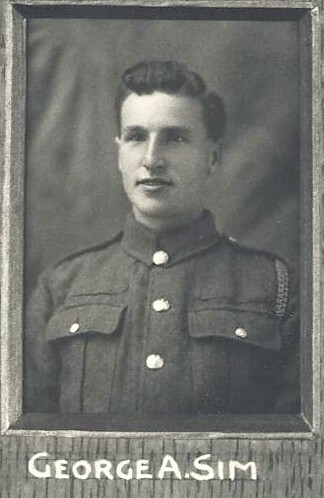 Private 7718, 1st Bn. 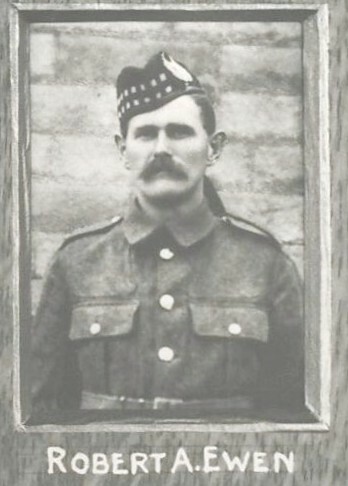 Black Watch (Royal Highlanders) 01/11/1914 aged 34, died of wounds France and Flanders. 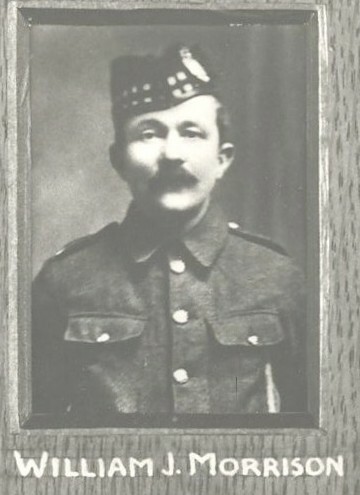 Born and enlisted in Aberdeen. 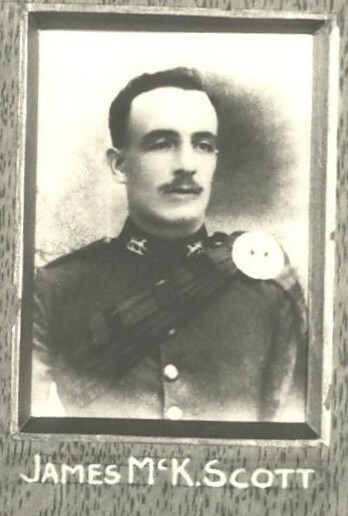 Son of Johnstone and Isabella Macpherson. Brother od Isabella, Jean and Elizabeth. 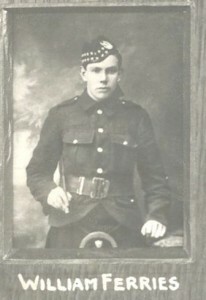 In 1911 lived at 35 Ashvale Place, Aberdeen and was employed as a Postman at the General Post Office, Aberdeen. 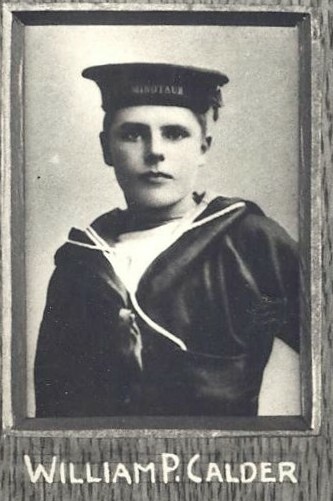 Sailed to France on 13th August 1914 aboard the “Italian Prince”. Ypres Town Cemetery Extension II. A. 11. Details as listed above under the Kemnay Primary School memorial. 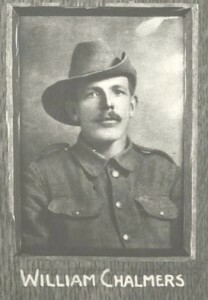 Morgan- Alexander Gnr 5658 3rd Australian Field Artillery e Brisbane 26 Died of Wounds F & F 17-Dec-16 Son of Archibald & Margaret Morgan, Hillford, Kemnay. Occ: Joiner. Ed Kemnay Higher Grade. St Sever Cemetery Extension, Rouen Fr 0146 Block O Plot III Row L Grave 6. Alexander Morgan was wounded in action on 18 November 1916 sustaining shell splinter wounds to his left hip and heel. 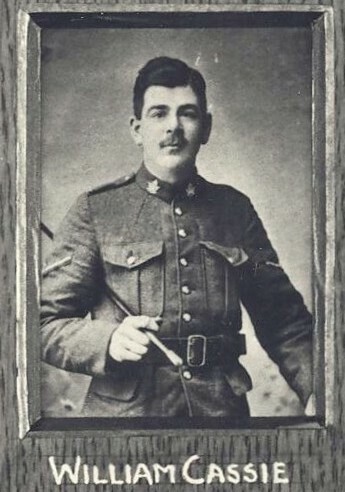 He died of those wounds at 12.12 pm on 17 December 1916. Smith – Reverend Peter George B.D., C.F. 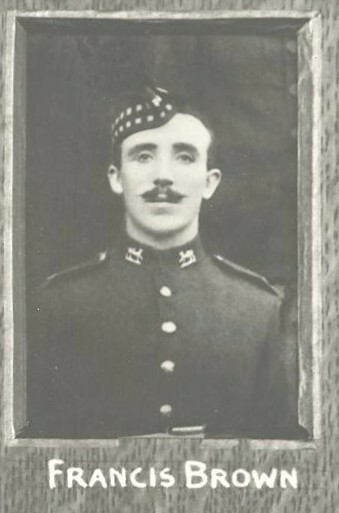 Captain (Retired), Chaplain to 4th (Donside) Volunteer Battalion, Gordon Highlanders and 9th Cameronians, 3/12/1919 aged 41. Rev. 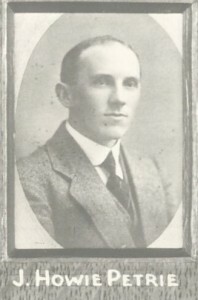 Smith studied Divinity at Glasgow University and was ordained to the Parish of Kemnay in 1904, leaving for the Parish of Kippen in 1908. 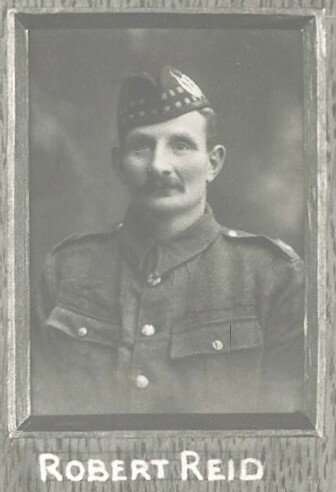 After the war broke out, he worked for a year at Colville’s Steel Works, Motherwell. 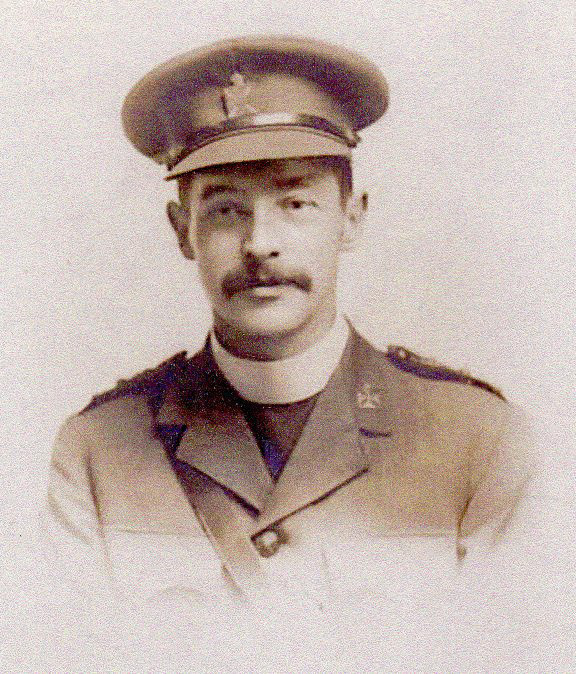 He then served for two years as a Chaplain in France and Belgium. 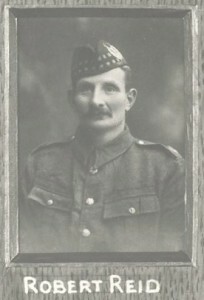 After the Armistice, he was stationed in Cologne but had a breakdown in health and was sent home to Craigleith Hospital, Edinburgh, where an operation was performed. He died of carcinoma of the stomach, liver and spleen, leaving a widow and six children. [Motherwell Times 5th December 1919.